With the intense summer heat that we get around Chicago’s North Shore, your air conditioning contractor is just as important as a good heating specialist. At Glenbrook Heating & Air Conditioning, we’ve been serving our neighbors year-round for almost 50 years, including expert air conditioning services to get your home cool and keep it that way. Contact us online or call 847-729-0114 to schedule a free estimate for air conditioning services in Glenview, IL and the entire North Shore area. Looking for a North Shore air conditioning contractor that you can trust for any kind of AC service? Glenbrook Heating & Air Conditioning has the skills and experience to provide repairs, maintenance, and installations of any type of air conditioner. You’ll love our unmatched level of customer service, too. And more AC services for equipment of all kinds! Our qualified technicians are here to help with the important step of installing or replacing an air conditioner in your North Shore area home. Whether you’re replacing a broken AC, or adding a ductless mini-split to a basement or home addition, Glenbrook is the air conditioning contractor in the North Shore you can trust to get the job done right. For all our AC installations and replacements, we offer the highest level of service and quality as an American Standard Customer Care Dealer. We will evaluate your home’s cooling needs and go over the options with you, helping you select the right size and type of air conditioner for your home and budget. Just like a tune-up for your car, an AC tune-up helps you get better performance and longevity out of your equipment. Our North Shore HVAC technicians will undertake a thorough inspection and cleaning of your entire air conditioner. Air conditioner tune-ups by Glenbrook also include checking the coolant, tightening the connections, testing airflow, and more. The comprehensive maintenance service will leave your system primed and ready to provide stronger and more energy-efficient cooling. When a heat wave strikes the North Shore and your HVAC breaks down, you need an air conditioning contractor who can swiftly get things cooled down! With extensive training and experience, our technicians can diagnose air conditioner problems of any kind and make the necessary repairs for a reasonable price. Better repairs give you better performance and fewer problems for a long time afterward, so entrust your AC repairs with Glenbrook Heating & Air Conditioning, the friendly team that has been treating you like family since 1969. Make an appointment to get whatever air conditioning contractor services you need, in Glenview, Arlington Heights, or anywhere in Chicago’s North Shore area. 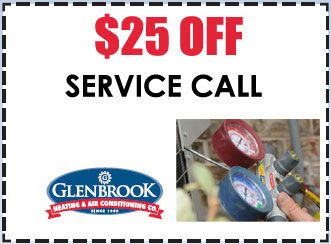 Call Glenbrook Heating & Air Conditioning at 847-729-0114 or request a free estimate online for air conditioner repairs, tune-ups, or installations.